Larry and I were married on May Day, an ancient holiday dear to me. Having everything we needed to start our life as a married couple, I jokingly asked the Universe to just give us livestock or gift cards to the grain store. In June, an amazing turn of events occurred. When we threw our wedding feast at our homestead on Summer Solstice, we were thrilled to introduce family and friends to many new additions, including a trio of American Guinea Hogs. My dream pigs. Due to their moving, friends gifted us the hogs and myriad new poultry. Our small farm had grown. The Universe had granted my wish. 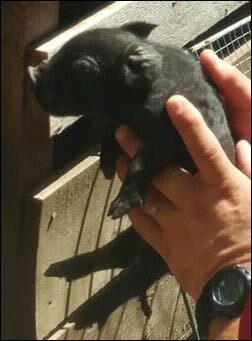 I could stop perusing “baby pigs for sale” posts. We had to jump in and learn all about raising pigs quickly. I had read that American Guinea Hogs provided some of the best-tasting pork, were friendly, and easy to manage. Yet much of the initial preparations before acquiring them was not fun. Some of it was even dangerous. 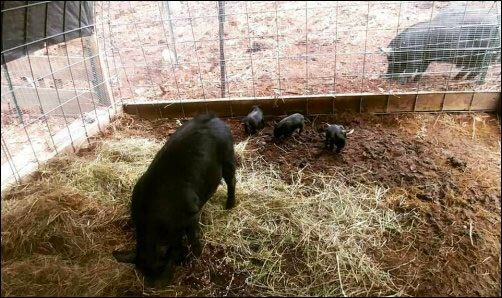 From moving the pigs to the homestead, to erecting “pig proof” fencing, figuring out a knock-over-proof watering system, to the first piglets born, and the reality of the boars’ desire to murder my husband, our experiences with them has been a challenge. Already incorporating many heritage animals (Heritage Turkeys on the Homestead, for example) into our small farm, the Guinea Hog seemed the ideal pig for us. 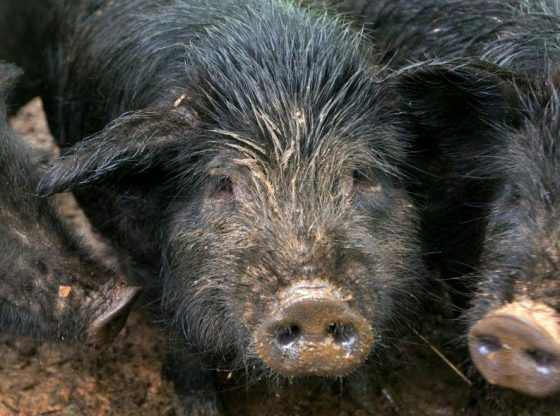 They were reported to be excellent foragers, hardy, docile, and being half the size of most hogs (with flavorful meat and outstanding lard)—the perfect size for two people to process themselves. All of that may be true, but I still questioned (on a regular basis), if they were the animal for us. Tonight, as I write this article—while I listen to the coughs of a sick piglet in the guest bathroom—I look back on the past four months. A call from a friend: did we want some more farm animals? After taking a drive to see what he had, we said yes. Returning to their farm with a huge wooden transport crate and several pet carriers, we collected the critters we would welcome to our homestead. The poultry was easy. I knew how to handle poultry. But hogs? Big, muscular hogs (the boar and one female were almost 100 pounds each, the younger one about 50 pounds)— that were scared to death of us and being moved—I did not know how to handle. Thankfully, my husband was less afraid than me. He entered their yard and removed each hog one by one. With all the running around, grappling, tying leads around them, and pig screaming, how he got them into the crate I still don’t know. I just know that when he yelled to shut the gate or the crate door, I did it fast and held it closed with all my might. Once home, we moved the crate (with the hogs in it) with the tractor, to the quarantine area allotted for them: a fenced-in section of land next to the goats. It was a smaller space than I’d envisioned for them. Regardless, l was thrilled they were with us. I had researched heritage hogs quite a bit, yet something that I wasn’t prepared for was their screams and foaming at the mouth when hungry. When they saw me coming around at feeding time, they went nuts. The boar would bite the girls; the scene was scary. I remember repeatedly asking my husband if the fence was strong enough. To keep the male from hurting the girls, I gave them lots of in-between-meal snacks. 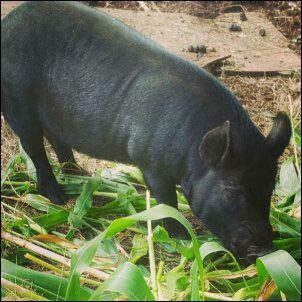 Names were selected: Mr. Hawg, Petunia, and Violet. We now had heritage hogs. It was time to move the pigs. Having mainly sloped, wooded land, with no substantial pasture, we hiked our property to find a more suitable location for them. On July 29th, a month after bringing them home, we moved them to a huge area that offered both shade trees and open sunny areas. The lot was covered in grass and brush. Once the summer foliage was consumed, acorns would drop from the trees. During a stressful (for me) move, Petunia got loose. She was easy to lead to their new area; I just kept shaking a cup of grain. I just thanked the heavens it wasn’t Mr. Hawg that got loose. Once safely in their area, I watched. They ran around and foraged. They seemed much happier, which made me happy. After the move, Mr. Hawg began to act increasingly aggressive towards Larry. Larry treated them all with care and respect, so it puzzled me. We researched possible causes and tried several techniques to diffuse the situation. Such an awesome month for the entire homestead! The hogs were content in their area. Busy foraging and enjoying the summer. They received the many scraps from our gardens. After every brush removal and tree-clearing project, we tossed their favorite brush into their yard, after the goats got their fill. The hogs were partial to beech, oak, and maple. The grass in their area was gone at this point, so I gathered a large bucket-full for them every night after dinner and tossed it in. They also munched on the patch of cornstalks we lopped down. They were eating much less grain and looked to be in perfect shape. Except Petunia. She looked wider. I wondered if she was pregnant, but her genitalia did not match the photos of pregnant sows I saw online. Her udders were not hanging either, but they were starting to look different. I monitored her closely. She probably got tired of me staring at her hind and milk bags, but yeah, I wasn’t sure if she was pregnant or not. Mr. Hawg was (mostly) fine with me, but he was still keen on murdering Larry. After watching him attack the fence at Larry, and then nipping at me several times, I stopped going into the hog area. I simply did not trust him. We made plans to separate him from the girls. We even moved a portable poultry tractor to the far side of the area. Larry erected more hog fencing, so Mr. Hawg would have ample room to roam, and I could interact with the girls without fear. However, Larry’s work schedule suddenly got busy. The gate and hut still needed work, so we had to put off moving Mr. Hawg. The plan was to get him moved by September 6th. September 2nd, 7:00 AM: Three squealing hogs demanding breakfast when they see me doing rounds. Mr. Hawg nipping them to get first dibs. Nothing unusual. At noon, what I saw wasn’t just unusual, it was surreal. The hogs were napping in their hut (on hot summer days it remained cool in there). As I approached their yard, Mr. Hawg and Violet hopped out of the hut, and began jumping at the fence-squealing and foaming at the mouth. Just as I dumped the first cup of feed in, Petunia hopped out of the hut. With a long red, bloody mass hanging from her behind. I had zero idea what it was, until a wee piglet tumbled out of the hut (there was a one-foot drop from hut to ground). I stared at it, then at Petunia, who in between mouthful of lunch, squatted to expel the placenta hanging from her hind. What the… I froze when another piglet tumbled out of the hut. The piglets staggered and cried, apparently as confused as I was. When they rolled under the hut, I shook away my shock. After a quick peek through the slits on the side of the hut—and seeing another piglet in the corner (it was not moving)—I called Larry because, of course, I’m usually alone when crazy things happen. The next hour was hilariously hectic. I will not go into the absurd, tear-soaked details, but in that hour, I somehow had things in some semblance of control. Mr. Hawg was in his new area. I still don’t know how I lifted logs over the fence on a ladder to secure the gate, but apparently, that is exactly what I did. That, and wrapped about a zillion straps and bungee cords to keep him contained in that yard. The newborn piglets that rolled under the hog hut were pulled out (I have a vague memory of laying on my back, grappling at them with a branch and praying the sows did not trample me). While I did these things, Petunia gave birth to a fourth piglet. Sadly, the unmoving piglet in their hut was deceased. It was a large male. Mr. Hawg’s successor. Its death was Mr. Hawgs saving grace, as I wanted to keep only one boar on premises. When Larry, on his lunch break, came screeching into the driveway, he helped me get things in even better order. Tears of stress already shed, I was simply thankful he was there as I cleaned the afterbirths and tidied up the hut. The boy piglet was buried in the wildflower garden, atop the hill that overlooked his family. Petunias’ three surviving piglets were all girls. Seemingly healthy babies; when I finally walked up the hill to the house mid-afternoon, they were all actively nursing on mom. A few days later, Mr. Hawg was moved back with Violet, (the only way to stop his bashing the fence and gate) and we moved Petunia and her babies into that other hut, which Larry completed. The gate and yard were also finished. There. Now I could enjoy the new babies. Which I truly did. I think I took as many pictures of them as I did of my own human children. The piglets still nursed but increased their grain and plant intake substantially. They ate and grew. Grew and ate. Then ate and grew some more. Petunia’s food intake was increased to allow her to regain her condition. I fed them garden vegetables I had in the freezer, but the bulk of their diet was grain. A lot of grain. Their hut and yard were more than adequate shelter on mild days, but New England weather is unpredictable. I was anxious to move them back to the main area, into a wooden house. My anxiety was validated when the weather turned extremely windy and wet. It rained for days on end, followed by extremely cold nights. The weekly hut-cleaning turned into daily cleaning. I wanted them out of there. I still cut trees and gathered as much greenery as I could for them, but as the month progressed, the supply diminished. I fed them the last of our homegrown pumpkins. Grain intake increased even more. On the other side of the hog yard, Mr. Hawg’s behavior towards Violet had become increasingly aggressive. So, not only was Larry not a fan of him, Violet was being harassed all the time. I wanted him to work out so badly; yet when I looked at the piglets, I was torn. If an older female had a difficult time with him, how would they fare? I could not allow the possibility of them getting harmed by him. I thought about keeping him separated from the girls indefinitely and only combining them for mating. It took a lot of soul-searching to decide. 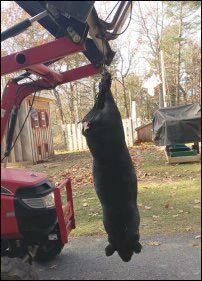 After moving a second wooden house to the hog area, we said good-bye to Mr. Hawg. We ended his life and processed him ourselves. It was Larry’s’ first time butchering a hog. Not wanting to waste even an ounce of meat or fat, it took him the entire day. Afterward, an experienced butcher critiqued his work. Not surprisingly, he was given an A+. I wasn’t surprised. He’s awesome. What I witnessed was shocking. Petunia attacked Violet. An all-out teeth-bared brawl ensued. Violet’s ear was bleeding by the time I intervened. Bad enough to require blood-stop (styptic) powder and triple antibiotic. The piglets stayed in their own yard during the fight, their little noses poking through the fence. The sows cooled down as they rooted in the yard. They snorted at each other, but thankfully there was no further fighting. Despite that initial conflict, Violet was gentle with the piglets when they finally ventured into the main yard. She allowed them to feed with her and follow her around. That first night, Violet slept in her old house by herself. Petunia and her babies slept in the new house. By the end of the week, the piglets took turns sleeping with Aunty Violet or Mom. By the end of week two, all five of them were sleeping together. During another stretch of wet, freezing cold weather (accompanied with snow this time), one of the piglets—Lily—got sick. On was an extremely cold and icy morning, Lily was standing way in the back of their house, hacking and coughing so hard that her eyes bulged. In a tear-laden, frustrated frenzy, I managed to remove a 50ish-pound screaming, thrashing, headbutting hoglet through the small doorway, load her in a crate I had strapped to the 4-wheeler, drove her up the icy hill, and into a warm house. With zero experience in swine ailments, I scoured the internet, and tapped into my knowledge of the Basics of Animal Aid. I applied several techniques to stabilize Lily: focusing on rehydration, cough suppression, rest, and warmth that first day and evening. Lily became a huge fan of honey. If I offered her the rehydration/cough-suppression concoction without it, she nudged it away. Although my general approach to healing is mainly based on natural techniques, on day 2 we gave her a shot of a broad-spectrum antibiotic. By day three, she was roaming around the house or bashing in her crate to get out. Her energy was back, and her symptoms were under control. On day 4, Larry returned her to her family, who appeared very happy to see her. We already have substantial snow here in New England and it is not even officially winter. The local ski-area opened before Thanksgiving. With a long winter is ahead of us, I want to simply enjoy our American Guinea Hog girls. But I kind of can’t just relax. Because of Violet. Since saying good-bye to Mr. Hawg, I have noticed changes in her. She has gained weight, for sure. I am not as sure about her teats, however. Are they or aren’t they lower? I am not sure if she’s just growing or… if she’s pregnant. She could deliver anytime this winter. Or could not. Will we be gifted with more piglets this holiday season, or will there be peace on our small farm? I guess we will find out. If she is pregnant, I am fairly certain of one thing: I will probably be alone when it happens! This article reflects your inexperience with pigs, not a reflection on the breed. You got a “pig in a poke” so to speak and probably got someone else’s’ culls, not quality pigs. 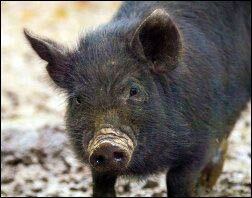 .Aggressive boars should never be bred. Most of mine have been docile and loving and have never threatened me. The mothers are attentive and I’ve never seen one run around dropping babies. Pigs are not complicated, especially AGH, but you need to do your homework. You have done a great disservice to this rare breed. Yes, the article reflects exactly that-MY inexperience with pigs.. No where did I state that this breed- or any other breed was good, bad or otherwise. I actually adore our girls, and if we do desire to get another boar-it will be a decision backed with more experience and knowledge. 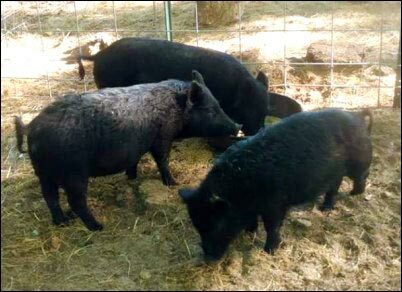 The trio of hogs were given to us, with very little information on their background. As newcomers to animal husbandry, we are quite good at improving any areas of our skills that need improving. After any ‘flunk’ , we do everything in our power to obtain future success. Such is the case with AGH. We are in a much better place now, than we were a year ago. Our girls are thriving. As far as doing the AGH breed a disservice? That is your personal feeling/interpretation. Here is my reply to Matt’s comment. I do believe the Facebook page is your baby? Thank you so much Matt! That is very neighborly of you 🙂 Are you referring to the Facebook page? If so, after reading this comment, I peeked at the AGH page (an associate of mine is a member). This article was shared there. To be honest, I am sure there are some super helpful people in that group, but I also see (from the comments not only on on mine, but on other posts), a fair amount of individuals who are quick to judge newbies. I am not interested in associating with individuals who judge. ANYONE. Unless a person is mistreating, abusing, or neglecting an animal- it is ineffective and useless. On the other hand, I am totality into belonging to groups with a large number of individuals who want to genuinely help others by offering advice, guidance, personal stories-with zero mocking or belittling anyone.. So, if there is another group you are referring to, please pass on the link! I am sure you are aware of the HUGE movement in the USA of new farmers/homesteaders desiring to get into growing/raising as much of their own food as possible. Many of these people do not come from farming families, have actual farming people to ask questions, and are learning. Useful groups that support their endeavors are important. Which is why I write for Homestead.org. Their mission is : To provide knowledge and companionship to homesteaders and other rural dreamers. As far as your personal hog experience- that is exactly what we are striving for, and we do really enjoy and love or girls. All 5 of them are extremely sweet, docile, and true pleasures. If we do get another boar, he will be carefully chosen from good lines with good temperaments. Thank you so much for your comment! Peace, May. I am sorry for your experience with these wonderful pigs. When we got our Guinea Hogs, we were unexperienced and had a few questions but nothing compared to your experience. An American Guinea Hog should never show any aggression, ever. Our boar does not invade our personal space and has let children rub his belly. Being docile is the most important trait for any guinea hog breeder, I would like to invite you to join the American Guinea Hog Association. You’ll find a great place to ask questions, get suggestions and see how different other breeders experiences are. Best of luck in your adventures. Hello, That is the ideal scenario when acquiring new animals. Your scenario is exactly the route we were lucky enough to take when getting into Nigerian Dwarf Goats. We were fortunate enough to obtain our 1st 4 goats from 2 wonderful mentors/breeders. Now we have an entire herd of registered dairy goats, our own buck, and ample supply of goat love & fun, as well as lots of goats milk to do as we please. We also breed heritage turkeys, heritage chickens, and Muscovy ducks. for our own purposes. In the case of the hogs-there is a backstory to their arrival at our homestead which I do not go into out of respect for the previous owners. Their story and dire situation is no ones business. I treat their situation with compassion, care, and class-by not discussing it.The animals gifted to us were not planned. For all the animals sake, it was an emergency situation. We put up fencing and built housing within 24 hours of learning of the situation. The boar was treated with the utmost care, respect, and dignity the entire time he lived with us. Our girls are blessings. They are also given the utmost care, and truly adored. The initial experience was neither a success or failure. It was reality. It was a learning experience and a blessing. We have delicious meat from Mr Hawg,. The girls are delightful residents of our small farm. We may have been newbies to the hog world, but we are not newbies to animal husbandry.